Colors are an integral part of our lives and we all have our favorites. Some of the colors have special effect on us while some of them we simply don’t prefer using. No matter what, we do know something about them and that is for sure. Let us today have a look at some of the questions and their possible answers related to colors. I love violet color and then there are red, orange and blue that I really find interesting as well as attractive. I don’t really like any particular color. 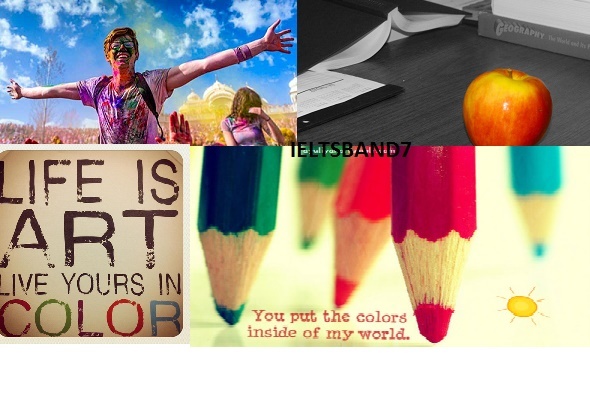 For me, I would say, I am love with all sorts of colors. I find them all so very important in different aspects. Like you need a black shoe to be able to carry it with everything and then you might not like black walls. So, I think I love all colors and it is just that I love in different ways. Why do you like the particular color? The reason I really like violet is because I think it gives a sense of royalty and at the same time peace. It is neither very loud and nor very dull. Moreover, it really suits me and so I love it. The reason I love red is because it radiates so much of energy. Whenever I see a red, I feel so much more energized about life and things around. What color would you paint your car, and why? I think I would definitely go for a black in my car. I really like black cars because apart from the fact that they look way more royal there is less maintenance associated with them. Like those dents and dust don’t appear too loud when the car is black. Do you like red color? Why/ why not? I really am not very fond of red color, because it is too loud and I really like calm and peaceful colors. I think it is good when you have to go out to a party or when you are trying to wear the best wedding outfit but in general sense, for the everyday life I prefer not using it. Oh! I am in love with red color. I think it is not only vibrant but also displays lot of power, anger, love at the same time. And I think this mix of emotions that red can very easily display, makes me like it. There is this mystery around this color which fascinates me. Do you like green color? Why/why not? I would say I am not totally in love with green color, but I think it is surely that one color which is very important in our daily lives. Because of its similarity with nature, a green color brings in with it lot of peace and calmness in our minds. Some say, it represents self respect and balance in life. I think whenever I do require balance, I definitely go for lot of green. Do you usually wear clothes in your favorite color? No, not really. I do have a favorite color but it does not mean that I need to flaunt it everyday. But, yes whenever there is something important or when I am not feeling good I prefer going for my favorite color clothes. Because they give me lot more confidence and a feel good environment. Are there any colors that have special meaning in your country? I think, green, saffron, white and blue are the four colors that hold lot of importance in my country for the reason that they are associated with our national flag. Also, in marriages, we prefer having flowers of saffron or orange color. Do you think different types of people like different colors? I think definitely yes. A choice of color depicts a lot about personality of an individual and it is more of a personal choice. For example, someone might have a meaningful association with possibly red color, because it reminds them of something, so it is their favorite color. Likewise, every one can have and do have different choices. Are there any colors you dislike? Why? Dislike I would say would be a big word. But yes, I prefer not having browns around me. It is a nice color but for me it does not hold any meaning and I really cannot associate it with anything. So, I prefer not using it much. Are colors important to you? Colors are very important for me. They are the representation of what I feel about something or what I am feeling at a particular moment. Like when I am really very sad, I prefer wearing a violet because it is my favorite color and wearing it makes me feel pumped up. Were colors important to you when you were a child? As a child, I would say I was not very much bothered about colors. I tend to enjoy all of them. Back then, I think what mattered the most was the friends that I had and the people I met and the memories that I made. When you are buying something, is the color important for you? The importance of color depends on what I am buying. Like for a shoe color definitely matters to me. I cannot wear a neon or a red color shoe for sure. But then while buying clothes, I would say colors don’t matter much. As long as the entire thing looks great on me, I will buy it, irrespective of the color. Likewise, while buying a phone or any other electronic item I would prefer a black. If you were to paint the walls of your room, what color would you prefer? I would definitely go for a dark violet on one wall and a lighter shade on the others. For me, violet bring with it lot of positivity and energy along with it and so I would definitely prefer it. I think I will go with a white because in my opinion for a wall there is nothing better than a basic white. On top of that, I might think of putting some painting or may be painting directly something on the wall, something that would depict what I want to be.